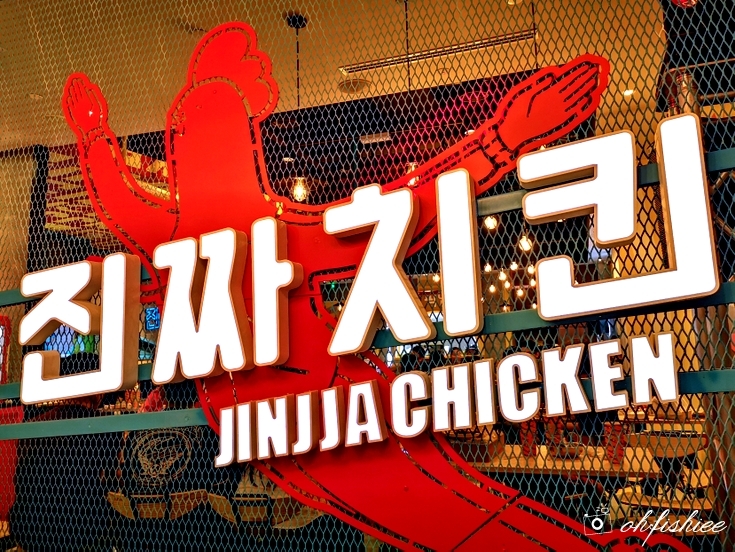 then let JINJJA Chicken proves you wrong! 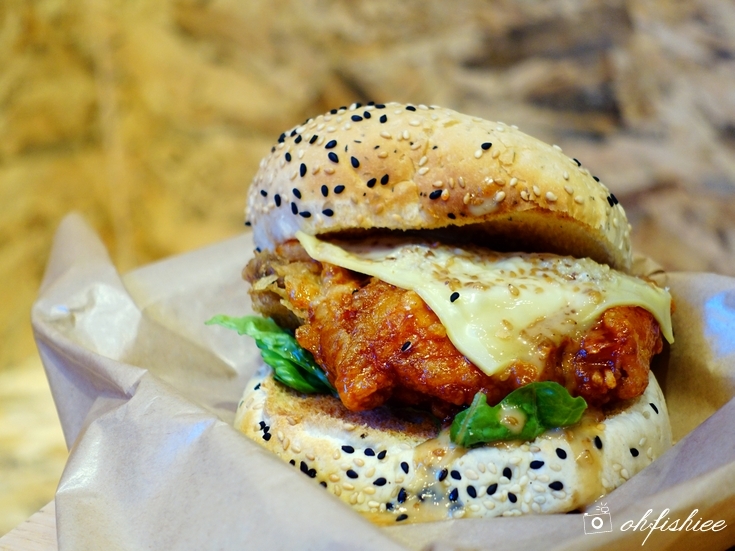 Admit it, we all love the South Korea's rich street food culture, don't we? 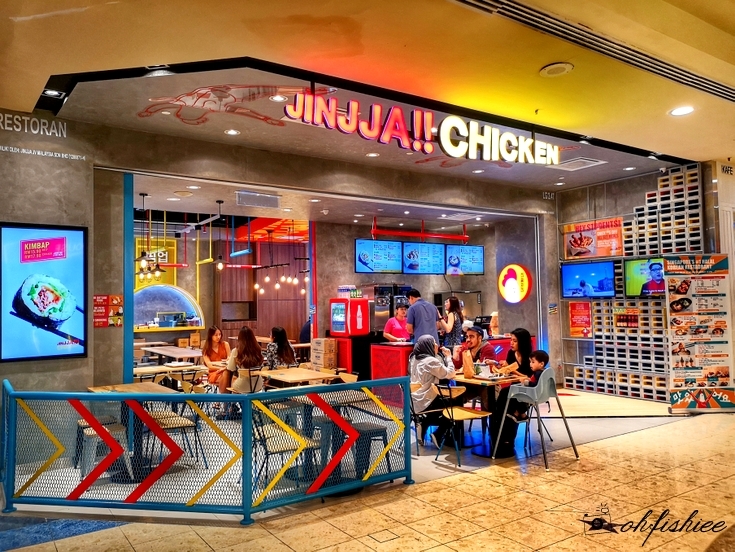 Brought by the K-wave, JINJJA Chicken is here in Malaysia to bring us the "Authentic Asian Fast Food Joint" experience. 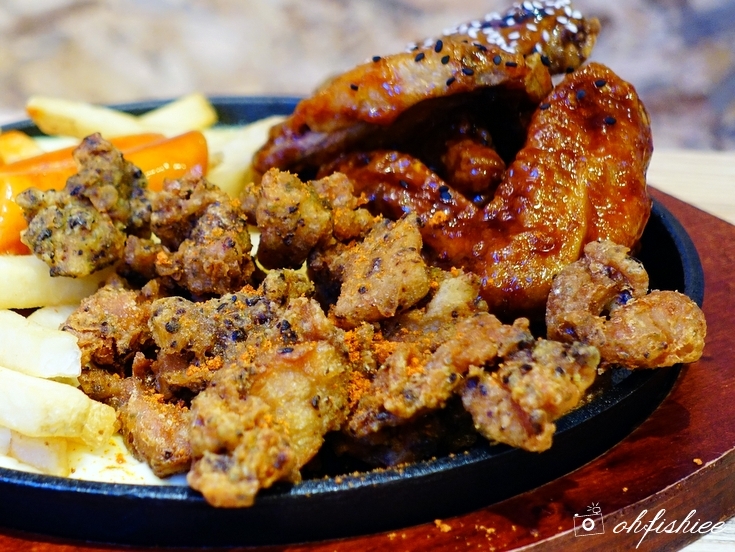 With a wide-ranging menu featuring the signature fried chicken and our all-time favourite rice and noodle staples, here we can get our Korean fix in a quick, easy and affordable manner! 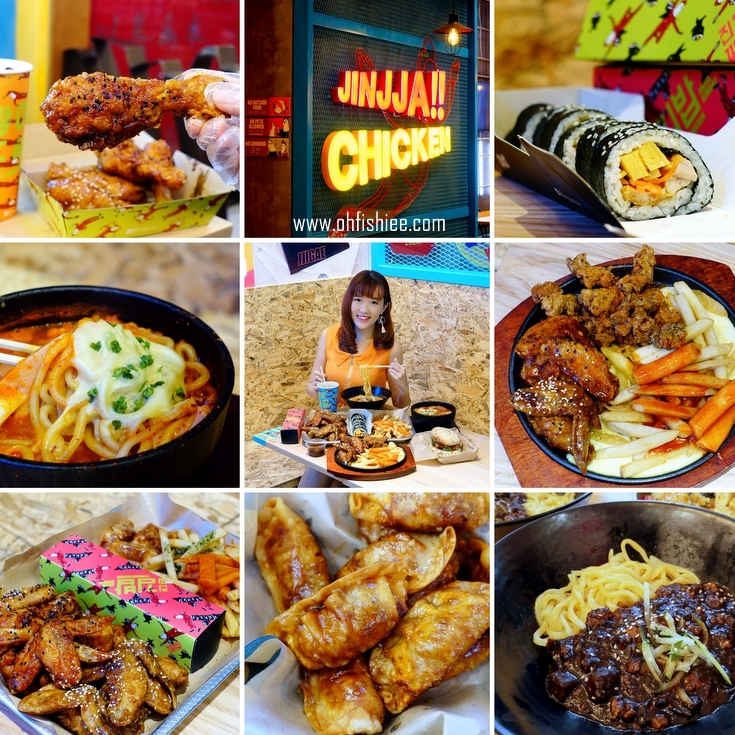 JINJJA Chicken is Muslim-friendly as it is certified HALAL in Singapore and is applying for Halal certification in Malaysia. 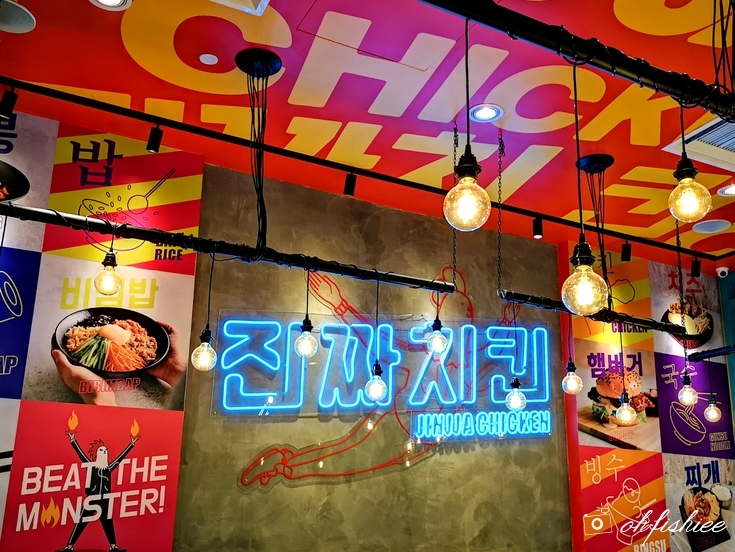 Upon arriving at JINJJA Chicken Sunway Pyramid outlet, the first thing that attracts me is the vibrant exterior adorned with bright light bulbs, neon signage and quirky paraphernalia displayed on the wall. 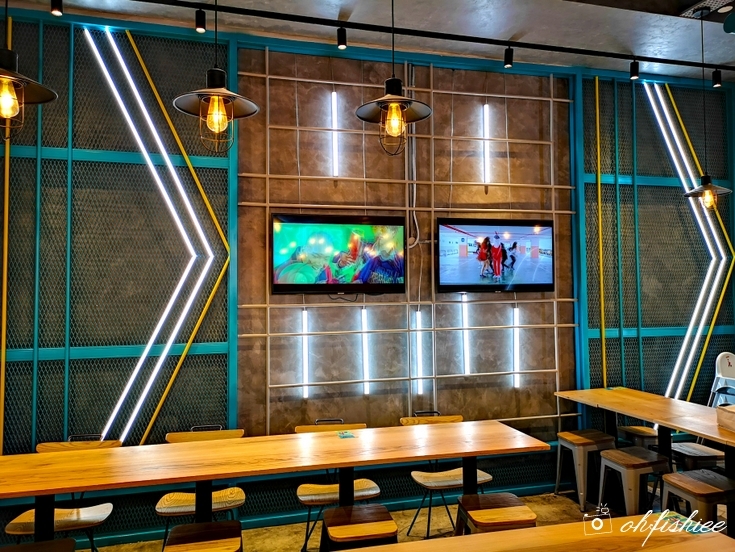 In the warmly-lit seating area, it exudes the hipster vibes with K-Pop music videos playing on the wall TVs. Totally lifts up our mood and makes us feel at ease! Ordering is easy like any fast food counters. Then I am given this device that vibrates once the food is ready for collection at another counter. Thanks JINJJA for adopting the Korean pali-pali (빨리빨리) culture of speed, our food is ready within a mere 10 minutes! But be prepared to collect the food from the collection counter in several rounds, as each and every item is prepared freshly from the kitchen. Look at what we have ordered! Oh yummy, they smell so good. 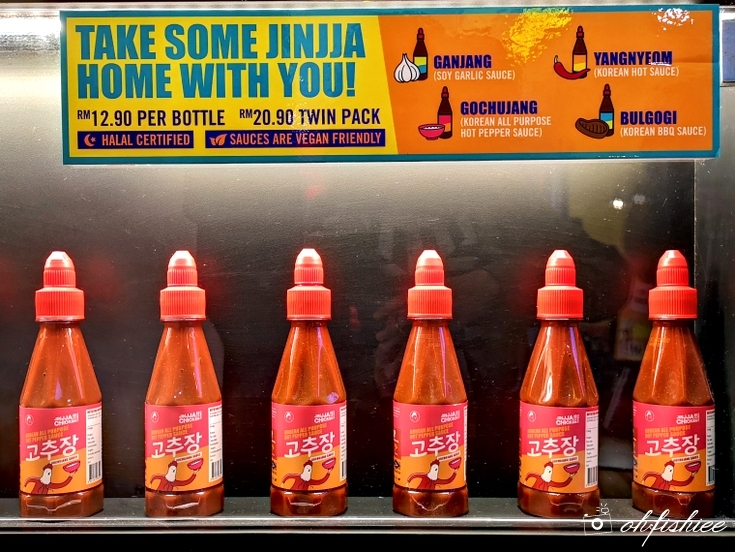 Despite of being a fast food joint, I like how JINJJA Chicken holds to its principles of minimising the use of preservatives, additives and overly processed ingredients. 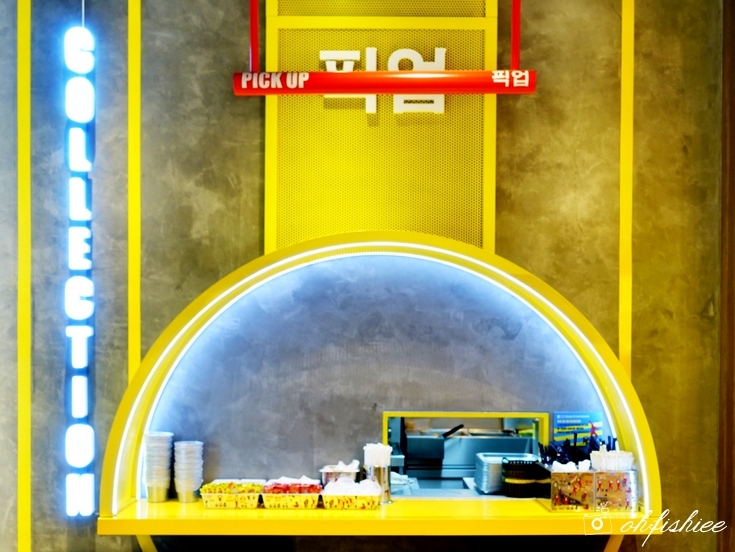 In fact, it even sources for ingredients and recipes from all over Korea! 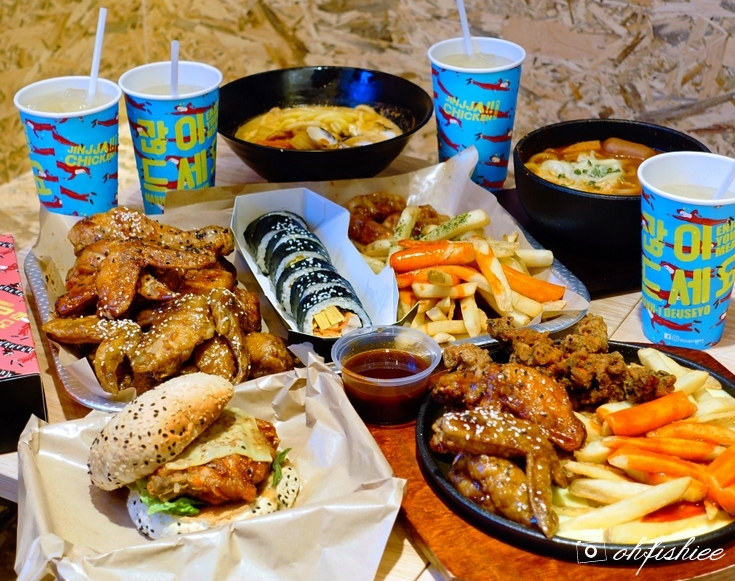 To be honest, it is difficult to decide what to order when I feel like trying all the signature fried chicken, rice, noodle, burger, salad, light bites, bingsu dessert and ice creams! Luckily it serves party sets that combine a good variety of main dishes, snacks and drinks. For a start, we go for the Big Bang Set which feeds 4-5 pax. Super good value-for-money set since everyone can share and try different things! They also have Bigger Bang Set for bigger groups (8-10 pax). 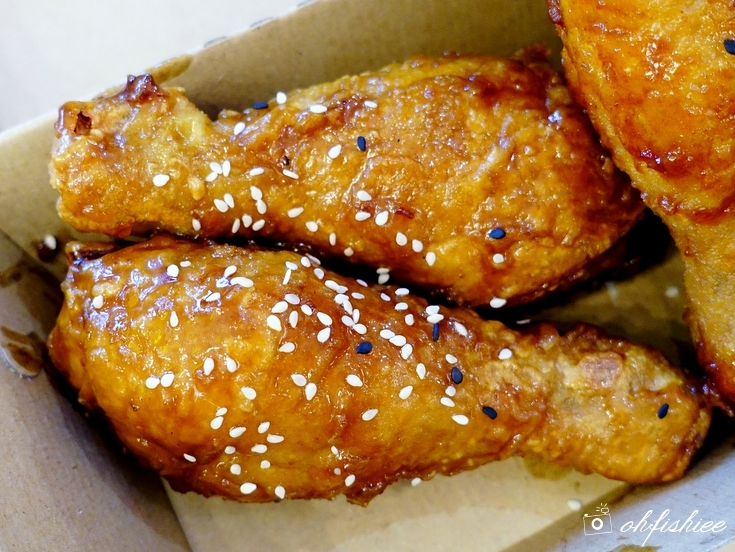 As much as I love the garlicky aroma of the Soy Garlic chicken with white sesame topping, I personally prefer the sweet and spicy Yangnyeom flavour with black sesame as it gives an instant kick on the palate. Super good! 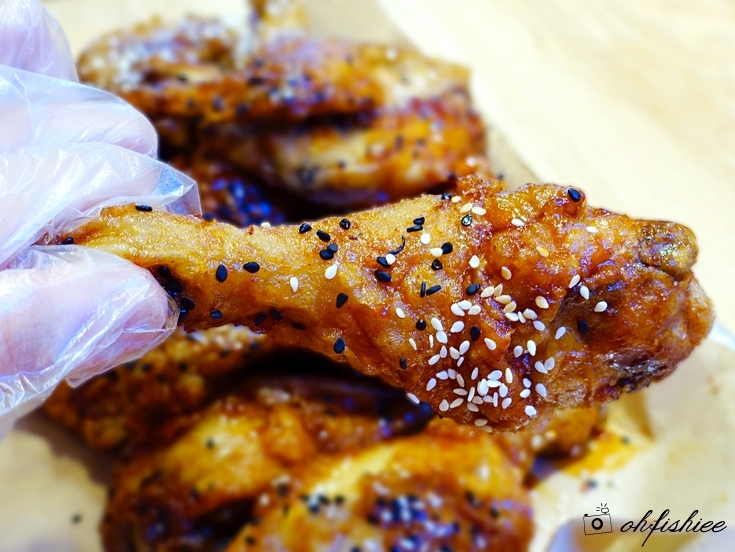 Nevertheless, the chicken wings and drummies are all so crisp on the outside and fluffy inside without being overly greasy. The set also includes Kimbap, the chicken-and-kimchi-filled sushi in Korean style. Super dense and filling, who say we can't have our No.1 staple rice in Korean snack? 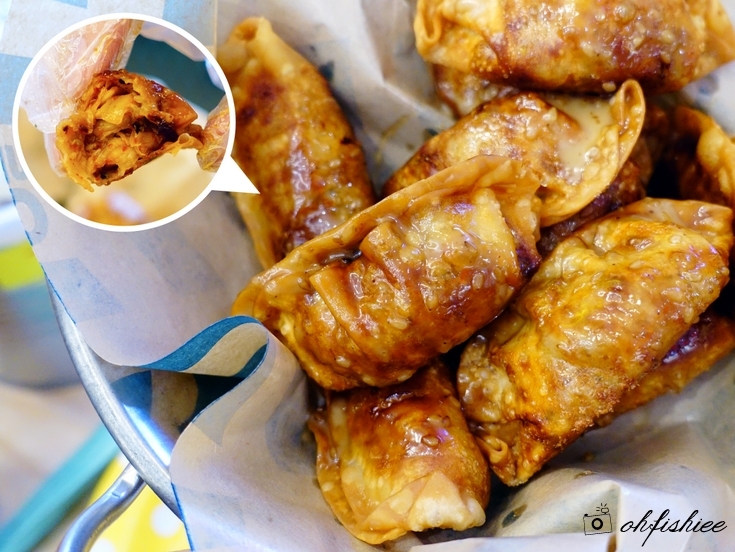 I am usually a fan of Japanese gyoza, but I didn't know that Koreans have the similar pan-fried dumplings called Mandu! With the tangy kimchi and minced chicken filling, I must say the Korean version served in JINJJA Chicken tastes amazing. 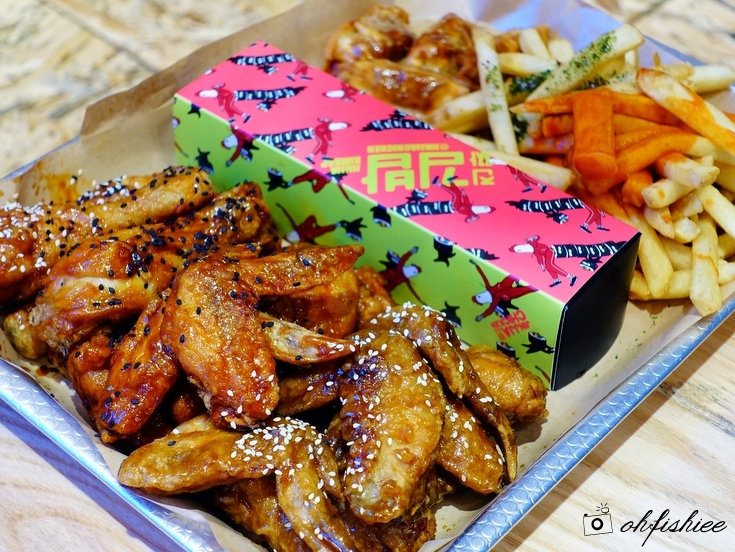 Another sharing platter worth going for is the K-Cheese platter which you can mix and match chicken wings / drumsticks with your preferred flavours of chicken popcorn and fries. Everything tastes so good with the bed of melted cheese. But be sure to savour it fast as the cheese tends to harden once it cools. Try this if you love the crunchy goodness! Whenever I explore a new restaurant, I always go for something that I have not tried before and this Jjajang Myeon (Sweet Korean black bean sauce noodle) is definitely on my list. They look pretty ordinary but little did I expect that they actually taste so good! Just mix the noodle well with the sauce and enjoy slurping it down the throat. The sweet and savoury flavours complement each other well and keep me craving for more! 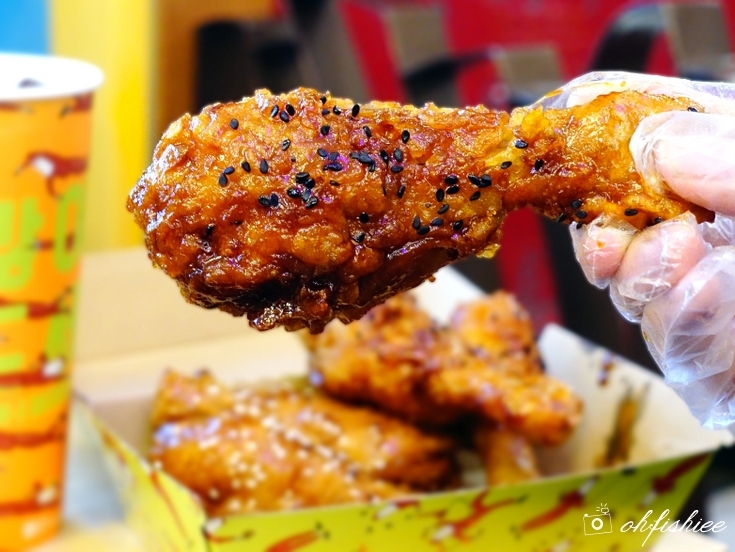 For the health conscious, don't worry because JINJJA Chicken has something for you too! A nice variation from the usual rice-loaded bibimbap, we enjoy every mouthful of this protein-packed Tofu Bibimsalad which is beautifully composed of beancurd, seaweed, cucumber, carrot, tomatoes etc. 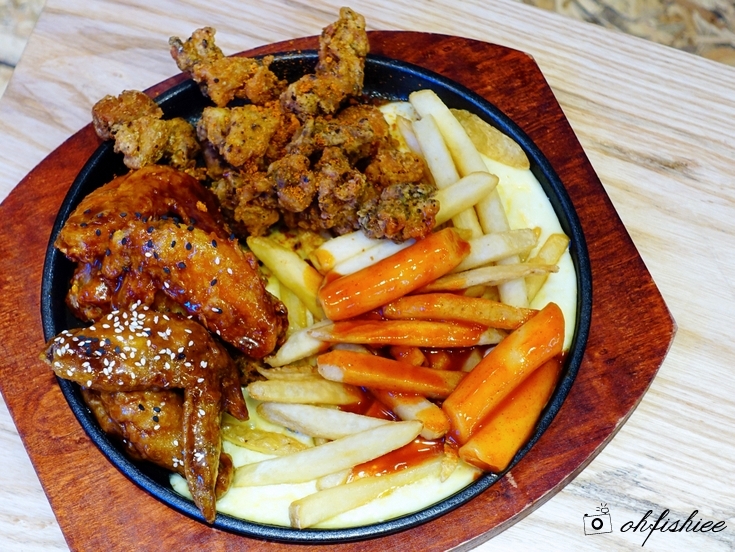 Another point worth mentioning about JINJJA Chicken is that it also has basic stuff for those who prefer traditional Korean flavours. Army Stew is one of them if you prefer simple comfort food that warms the stomach, as it is loaded with bouncy noodles, cheese, luncheon meat and sausages. Similarly, Jjampong is another soup-based dish available in JINJJA Chicken, but this comes with a lot of seafood. 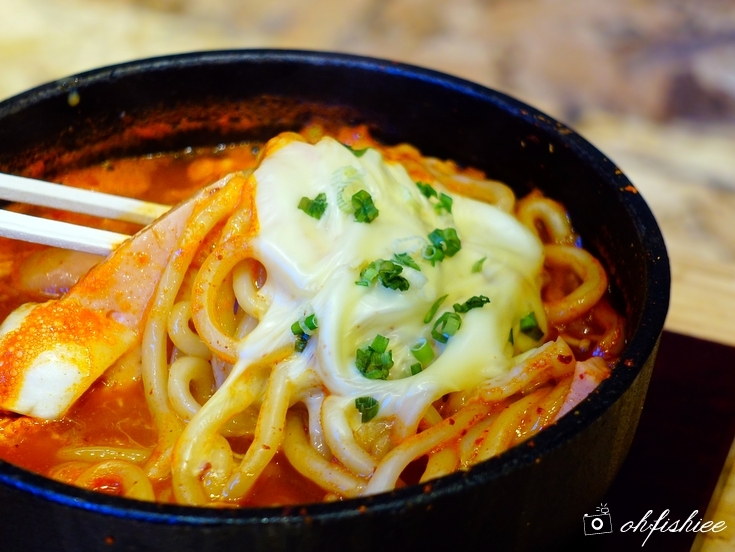 Soup wise, you can choose from 3 levels of spiciness (Creamy, Original and Monster). We go for the mildest one and find it very creamy yet the robust flavour is not lacking at all! Delicious and suitable for non-spicy eaters. I thought we have finished trying almost everything on the menu, but wait.... we still have some desserts coming! 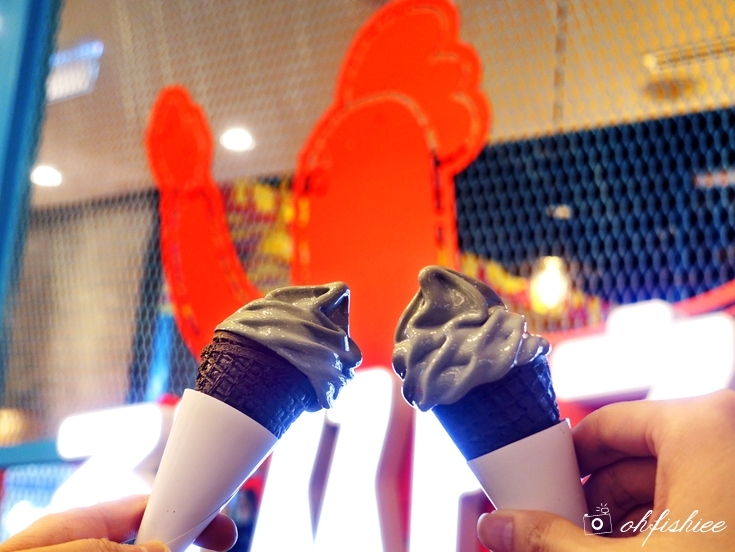 This is probably my first time trying such a unique charcoal caramel ice cream and you should give it a try too. 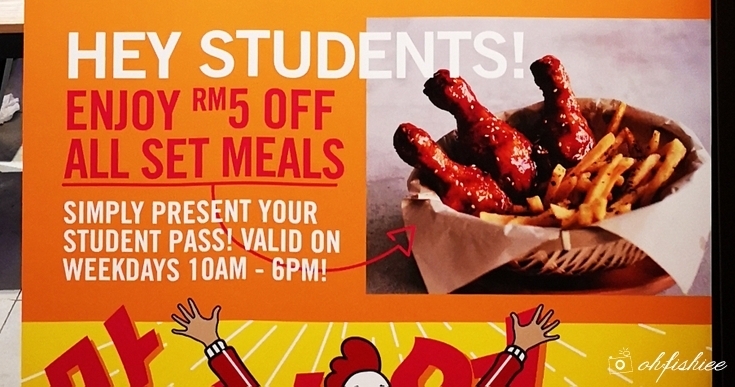 Promotion: Students get to enjoy RM5 OFF from Set Meals; Just flash your student card! 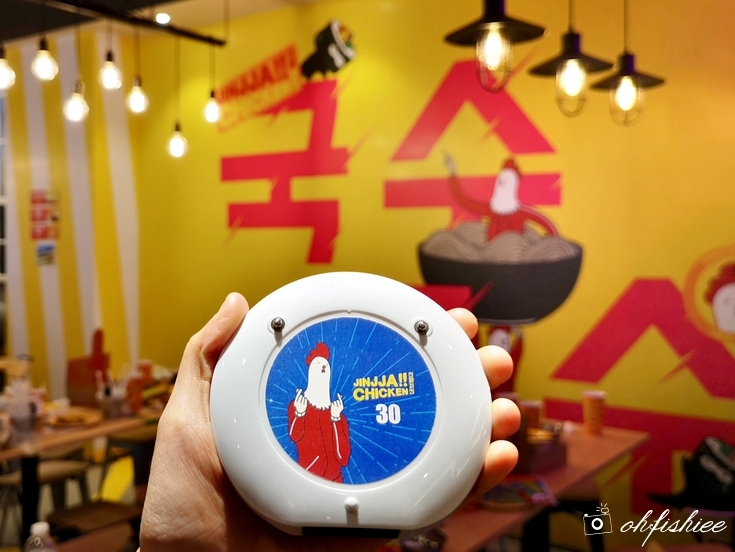 Don’t forget to take pictures at the Instagram-worthy spots in JINJJA Chicken too!